Slow cookers, pressure cookers, and the increasingly popular Instant Pots are convenient kitchen appliances that have much in common. For one thing, they all use moist heat, and they take a lot of the hassle out of preparing foods, like dried beans or braised meats, that typically take a long time to cook. Because they all use moist heat, these appliances won't produce crispy textures or give cooked meats the browned exterior that results from roasting or sautéing. Fortunately, with meats you can achieve this by browning the item on a hot skillet before adding it to the cooker. This happens to be a standard prep stage when using the traditional braising technique. Here's a summary of each appliance, how to use it and a few recipes each one is good for. And of course, with all the devices described here, follow the usage and safety instructions that accompany your particular model. Slow cookers (some go by the brand name of Crock Pot), are a widely beloved and infinitely useful appliances that, depending on size, can cook anything from oatmeal to brownies to lasagna—even a whole chicken. Slow cookers use low temperatures and moist heat to gently cook food over a long period of time—usually anywhere from four to 10 hours. This kind of slow, moist cooking is ideal for cooking beef pot roast or pork ribs, both of which come from cuts of meat that are high in connective tissues that can be tough if cooked improperly. Long application of moist heat and low temperatures are exactly what work best to break down those tough bits, producing tender, succulent meats. And while a whole chicken prepared in a slow-cooker won't have the crispy skin produced in an ordinary hot oven, slow-cooker chicken produces a juicy, fall-off-the-bone result that is one of the ultimate comfort foods. Soups, stews, sauces, and beans are also ideal candidates for being prepared in a slow cooker. Simply combine the ingredients, cover, and set the cooking time and go about your business. Other fun items include apple sauce, mac and cheese, and homemade yogurt. 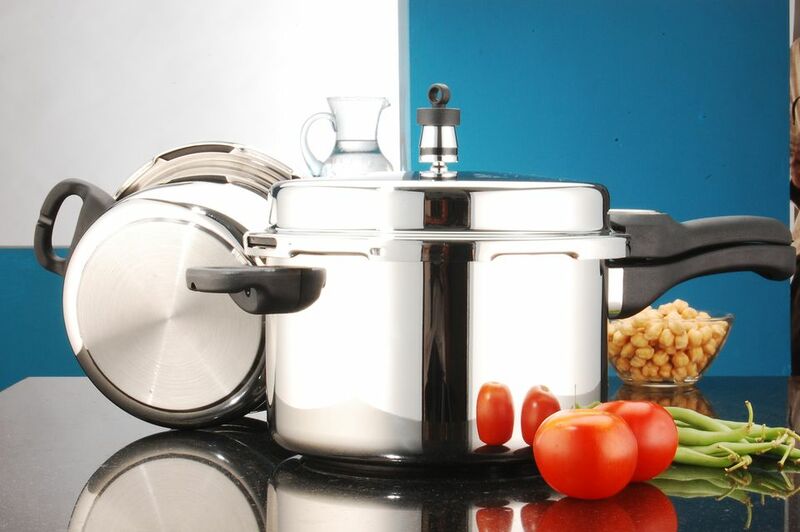 Probably the main safety consideration with slow cookers is that because they employ low temperatures, if the machine malfunctions or you load it up with too many frozen items, it might take too long to reach a cooking temperature high enough to kill any bacteria that might cause food poisoning. However, one of the major conveniences of a slow cooker is that you can load it up with dinner in the morning when you leave for work, and return to a kitchen full of yummy aromas and a deliciously cooked meal. The downside is that if a power outage occurs while you're away, there's a chance that harmful bacteria could proliferate. Other than the fact that they both employ moist heat (and both have lids), pressure cookers are the opposite of slow cookers in nearly every way. Unlike a slow cooker, which takes the normal cooking process and slows it down to a crawl, pressure cookers are all about speeding it up. How they do this is by using pressurized steam. As you probably know, the boiling point of water is 212 F. It boils and it turns into steam and evaporates. There is no way to make water hotter than 212 F.
Steam, however, can get hotter than 212 F if it is under pressure. The temperatures inside a pressure cooker can easily reach 250 F, which might not sound like much, but that level of increase can actually accelerate cooking times by as much as four times. How they work is after adding the food to the cooker, the lid is clamped shut and sealed with a gasket, and then heated up on the stovetop. A valve allows steam to escape in a controlled manner, which is absolutely crucial, because that's what prevents the thing from exploding. Like slow-cookers, pressure cookers are great for preparing meats such as short ribs, pot roast, and chicken. Dried beans and legumes can take as little as 30 minutes in a pressure cooker, as opposed to up to two hours using ordinary simmering. Items such as fresh vegetables don't fare quite so well in pressure cookers since they are highly prone to overcooking. Also the cooking times are so brief that getting out the pressure cooker to cook them is scarcely worth the trouble. Soups and stews, on the other hand, are excellent choices. As mentioned above, pressure cookers can be dangerous is used improperly. Unlike a slow-cooker, which is fine to leave on while you're not home, a pressure cooker is something you need to keep an eye on. While they've become safer over the years, they're still not the kind of appliance you would want to leave unattended. Mainly it's a matter of making sure the equipment is in good condition, particularly inspecting and periodically replacing the rubber gasket on the lid. It's also critical to use the proper amount of liquid without overfilling it. Here's more about pressure cooker safety. As always, abide by the manufacturer's instructions. Multicookers (also known by their most popular brand name, Instant Pot) are sort of a combination of the slow cooker and the pressure cooker. What they have in common with the pressure cooker is that they use pressurized steam to accelerate the cooking process. But like a slow cooker, they are powered by electricity rather than heated on the stovetop. Chili, soups, stews, and braised meats are terrific foods to prepare in an instant pot. Chicken, potatoes, and casseroles are likewise suitable, along with pasta, refried beans, and even mashed potatoes. Like the traditional pressure cooker, instant pot safety also basically amounts to making sure the lid seals properly, using enough liquid, and not overfilling. And of course, don't try to force the lid open if it doesn't want to go.